Hey there. Today I have some nail art using the new Pure Ice New Year, New Hue Collection. The full set has a bit of everything. It includes three jelly-based glitters, a creme, a glitter topper, a metallic, and a matte topcoat. You can see bottle shots of all the polishes at the end of this post. For my nail art, I used the three jelly glitters, Rosy Glow, Purple Haze, and Blue Hue. I started with a white base and used the polish brush to dab on the three jellies in a random pattern. I went over everything twice. 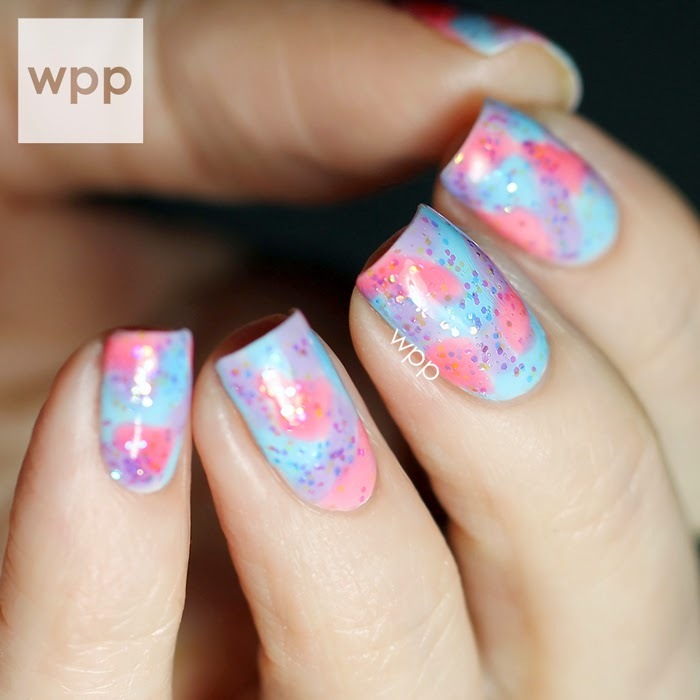 The jellies are sprinkled with the same light, iridescent glitter. It's subtle, but very pretty. I loved the consistency of these three shades for this technique. I gave it a little extra time before top coating since my color "dabs" were on the thick side. The Pure Ice New Year, New Hue Collection is available now for $1.97 each in Walmart stores nationwide and at walmart.com. Pure Ice has a brand new website in the works for 2015. Follow Pure Ice on Facebook and Instagram for updates.